Posted on October 9, 2011	by Derek "Gamer Crash"
Isn’t it crazy to think that we’re only a few short weeks away from Arkham City? With Rocksteady slowly dripping information into our collective mouths, I’ve been awe-struck at how much content they’ve managed to put into this game. It goes without saying, the huge amount of villains and major Batman characters that are also waiting for you. With Rocksteady pulling the plug on any more reveals until the game hits store shelves, it seems other outlets have now accidentally let slip two more players for Batman to contend with. For those of you sensitive to spoilers, I’ve listed out who you can expect to find below the jump. 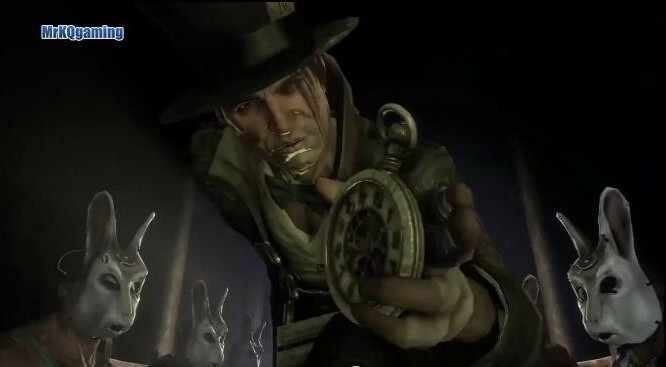 This month’s episode of Qore over on the Playstation Network showcased a bunch of the villains and actually contained footage of the yet to be revealed Jervis Tetch, better known to fans as The Mad Hatter. If you can spot her, Poison Ivy also makes a very short cameo in the video as well. Who knows how big a role these characters will have. I’m guessing that they’ll be a part of the story like Victor Zsasz was in the first game or even be available side missions. Obviously, there will be villains with a big role such as Dr. Hugo Strange and The Joker. Either way, we’ll only have to wait something like 2 weeks to find out for ourselves.